David A. Broecker, President and CEO of the Cambridge-based Alkermes, has been elected to the Wabash College Board of Trustees in balloting by the College’s alumni body, the National Association of Wabash Men. Broecker edged out David P. Lewis ’81 and David L. Callecod ’89 in this year’s election for Alumni Trustee. 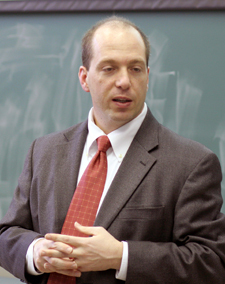 After earning graduate degrees from MIT and the University of Chicago, Broecker spent the first half of his career at Eli Lilly and Company. In 2001, he joined Alkermes, a biotechnology company that specializes in therapies for widespread, chronic diseases, including central nervous system disorders, addiction, and diabetes, as its president and COO. He was named CEO in 2007. Broecker previously served the College on the Board of Directors of the National Association of Wabash Men. The alumni body also elected three alumni to the NAWM Board of Directors — Terry Hamilton ’89, Rick Strasser ’02, and Kip Chase ’03. "This year’s tickets for the NAWM Board and Board of Trustees was what many described as the ‘can't miss ticket,’" said Tom Runge ’71, director of alumni and parent relations at Wabash. "All of the candidates are leaders in their professional lives and dedicated and loyal alumni." Hamilton (left) is the senior vice president of operations for St. John Health Systems in Detroit, Michigan. A member of Phi Kappa Psi fraternity at Wabash, Hamilton was a key volunteer leader in the $2.8 million renovation of the chapter house during the Fraternity Partnerships Campaign. Strasser, a history major at Wabash and member of Phi Gamma Delta, is a senior consultant with IBM Business Consulting Services in Falls Church, Virginia. Chase, who also majored in history at the College, is an associate with Eli Lilly and Company in Indianapolis. "The elections for the NAWM Board were extremely close — so close we pored over the ballots for a second and third time," said Runge. "Another thing this year’s election slate indicates is that the alumni current Alumni Board embraces the challenge of engaging younger alumni — Terry Hamilton is the most senior member of the new Alumni Board members and he's in his early forties!"